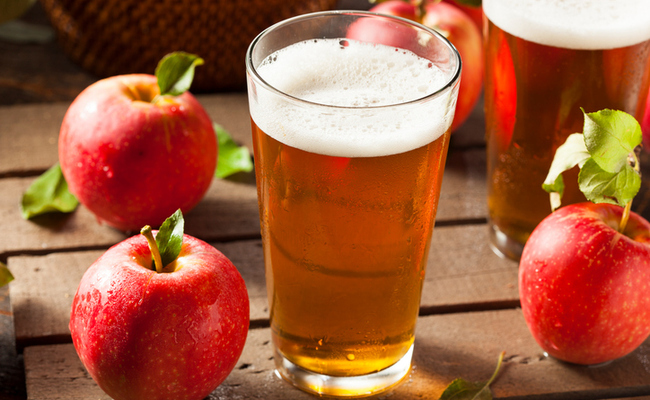 Care2 Healthy Living | Is Hard Cider Healthier Than Beer? Is Hard Cider Healthier Than Beer? Alcoholic ciders have become wildly popular as an alternative to beer in recent years, especially among the gluten-free set. Sure, the main ingredient is apples, but is drinking cider really any better for your health than beer or any other alcoholic beverage? As a cider lover myself, I decided to take a look at the nutritional realities of this popular adult beverage in comparison to the world’s favorite alcoholic drink: beer. Keep reading to discover more about how your body processes cider, as well as tips for choosing the “healthiest” ciders. If you’re analyzing the healthiness of beer and cider based on the ingredient list alone, cider will almost always come out the clear winner. Hard cider is made by fermenting a combination yeast and apples—a fruit known to contain vitamin C and antioxidants. Beer, on the other hand, is made from a combination of yeast, hops, barley and other grains—which have been shown to have an inflammatory affect on the body. While proponents of cider may be able to boast a “superfood” in the ingredients list, things become a little less rosy when we look at how hard cider is processed by the body. Apples are up to 65 percent fructose, a naturally occurring sugar but—as far as your body’s concerned—a sugar nonetheless. The sugar content of most commercial hard ciders can be staggering–up to 23 grams (7 teaspoons!) per serving in some cases. Diets high in sugar have been linked to everything from obesity and heart disease, to depression and cancer, making cider a questionable choice for session drinking. Conversely, beer is typically sugar-free, and sweeteners are only added in small quantities by brewers to balance sourness. If you’re trying to go gluten-free or simply love the taste of cider more than beer, don’t get too upset. Your favorite adult beverage isn’t completely ruined, you just have to do a little more label reading and be a bit more selective about the varieties you bring home. The keyword you’re looking for? Dry. While “sweeter ciders are slowly fermented and repeatedly racked (moved to new containers) to strain the yeast that feeds on the cider’s natural sugars…Dryer ciders (meaning they contain less sugar) allow the yeast to consume the majority of cider’s natural sugars and result in a less sweet drink with a higher alcohol content,” explains Greatist. A win-win! Choosing dry ciders can help to keep your sugar consumption low while still enjoying an apple-y taste. Do you drink cider? What are your favorite “dry” varieties? Share them in a comment! Well, there can be a huge difference by the sugar that beer and cider may contain. People who keep track of their diet should be aware of this fact.